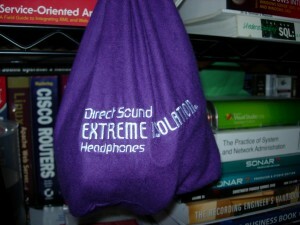 The Direct Sound EX-29, extreme isolation headphones absolutely live up to the hype. Bleed is non-existent; they are comfortable; they are clear; and they are very quiet. I’ve been using these in the studio for a few days now and I don’t know how I ever lived without them. Really- they are that good! I try to spend a good deal of time behind the kit if I can swing it – just for fun, but also working out drum tracks for new songs, and of course, recording new material. These headphones shine in all of these applications. 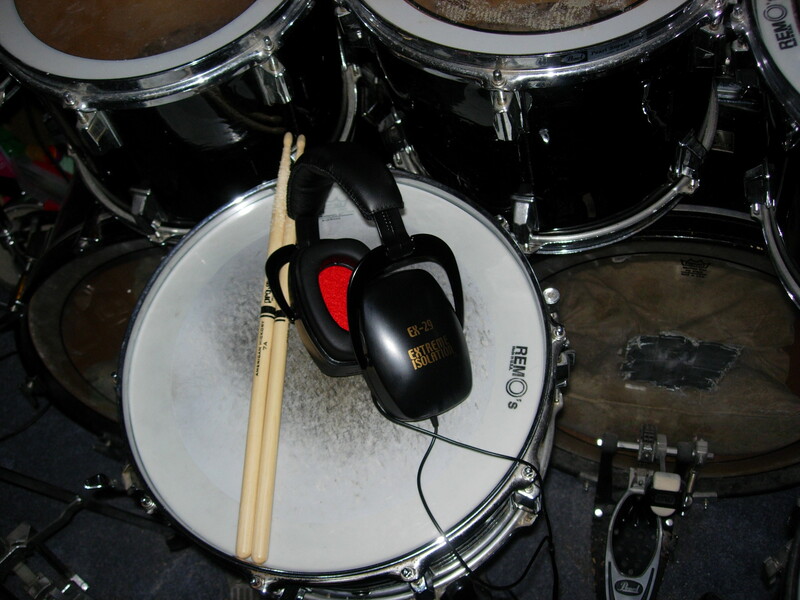 When I’m just jammin’ and keeping my chops up these cans help me keep everything at a sane volume which means I can work longer without fatigue and without damaging my hearing. In the past I have used ear plugs of various types and they have all had a few critical drawbacks that the EX-29s don’t. Two that spring to mind are comfort and clarity. [ What do you mean “clarity”… ear protection isn’t supposed to be clear anyway! ] I MEAN- ear plugs aren’t clear – ever! At least not in my experience. Nor are most other practical solutions. The EX-29s surprisingly don’t have this problem. One of the first things I noticed was how flat the attenuation was. After a few minutes in the relative quiet of the EX-29s I adapted and was able to hear everything – just at a lower level. This means I don’t lose crush rolls, ghost strokes, and cymbal shading for the sake of my hearing. Don’t get me wrong — it’s not perfect 🙂 but it is worlds better than any ear plugs I’ve ever used and the translation of subtlety has a big pay-off in that I don’t suffer any fatigue from trying too hard to hear what I’m doing. Then there’s comfort. Of course phones of any kind are going to be more comfortable than plugs… but the EX-29s do better than that. They are truly comfortable even after more than a couple of hours. They don’t squeeze your head, and they lack that pillows-on-the-ears feeling that typically comes with good protection. When I’m working out new drum tracks I often spend hours trying things out. That means playing back scratch tracks, samples, and loops and playing along to find the right grooves and fills. I used to use my Sony MDR-V600s for this. I would try to keep things at a low level, or I might use a bit of cotton (if I thought of it)… but invariably things would eventually get out of control or I would get tired from fighting with it and would have to come back later. The EX-29s have solved this problem for me. I don’t miss any of the clarity I get from my V600s AND I don’t need any cotton for the ears :-). The first thing I noticed when I used the EX-29s was that I had to turn my Furman monitor system way down! (ok, 2-3 notches) Everything was still clear, and I could hear my playing along with the playback without struggling to adjust to unnatural muffling. Even better – I didn’t get frustrated with it and discard my protection! The isolation is absolutely fantastic! I frequently play pieces that demand a lot of dynamic range (I’m an art-rock guy at heart). It’s surprising how sensitive the mics need to be when you want to capture the subtlety of such a loud instrument. Any bleed-through from the playback can destroy the subtlety of a quiet passage by forcing re-takes or necessitating the use of gating, expansion, and other trickery. It’s no wonder drums are so frequently sequenced these days– it boils down to time and effort (which means money). The EX-29s truly solve the isolation problem in two ways. The attenuation of the shells is quite substantial but in addition to that the quality of the drivers is also fantastic! This combination means that you can achieve comfort and clarity at substantially reduced playback levels. Not only is your playback not likely to get into your mics, but it is also at a much lower level to begin with. Do the math (I did) — you not only drop about 30db getting from the inside of the EX-29s to the outside; you also drop an additional 12-15db using lower levels in the first place. That’s 45db of effective isolation without struggling to adapt or building up fatigue trying to “hear it”. Compare that to what you’re doing now and chances are you’ll see a 20db advantage with the EX-29s – not to mention more comfortable and productive recording sessions. I’ll admit it – When I first heard about the EX-29s I was more than a little skeptical. They just seemed too good to be true. When I finally broke down and ordered them it was with the attitude that I’d give them a shot and if (when) they didn’t quite cut it I would find some other use for them.